Louie McCarthy-Scarsbrook’s last-gasp try at Wakefield maintained St Helens’ 100% start to the Super League season. The sides were locked at 18-18 and poised for golden-point extra time when the forward powered over. Tom Johnstone’s two tries sent Wakefield in all square at the break, with Morgan Knowles and Tommy Makinson crossing for the visitors. Regan Grace and Makinson made it 18-12 in Saints’ favour, before Bill Tupou levelled to set up a thrilling finish. A period of golden-point extra time to settle drawn league games was one of the innovations introduced to Super League at the beginning of the season, and this is the closest it has come to being required after two rounds. 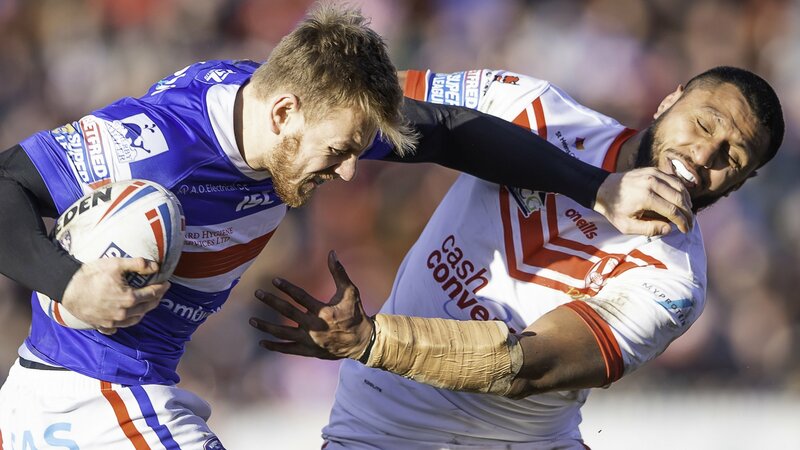 After beating champions Wigan in their first match, Saints have joined Salford, Warrington and Castleford with maximum points from their first two matches. Wakefield, who began the campaign with a loss at promoted London Broncos, are one of five Super League sides yet to get off the mark. Johnstone’s first try came while half-back Danny Brough was off the field, the former Scotland captain having been sin-binned for dissent. England winger Makinson enjoyed a stellar 2018, which ended with him collecting the Golden Boot award as the player to have made the biggest impact at international level. He was shut out by the Warriors in Saints’ season opener but got off the mark against Wakefield with his first two tries of the 2019 campaign. “I feel a lot better than I did seven days ago. It was a very difficult trip back from London, where we let ourselves and our fans down, but we got a response today. The response was magnificent. “There wasn’t a guy there that didn’t put in that effort. If we get that kind of effort every week, we’ll win more than we lose. “It was a really tough game, everything we expected after their disappointing loss last week and with it being their first home game. Wakefield: Hampshire; Jones-Bishop, Lyne, Tupou, Johnstone; Miller, Brough; Fifita, Wood, England, Ashurst, Kirmond, Arona.